 ColorPrint Easy is the easiest weeding print and cut material ever! Compatible with eco-solvent and solvent based printers/cutters ColorPrint Easy is just what the name says- EASY! Simply print and cut your design, weed the excess with ease, and mask. You say you hate masking because of all the pressure you have to apply to get the design to transfer to the mask? With the help of a Siser squeegee ColorPrint Easy transfers smoothly to the mask with little effort. Peeling the carrier is a snap too! ColorPrint Easy applies at only 300° F, which gives you the ability to apply to special materials that require a lower application temperature. Please note that ColorPrint Easy is NOT compatible with Latex inks. Not compatible with Inkjet or toner based printers/copiers. ColorPrint Easy is CPSIA Certified so you can have peace of mind when decorating kids garments!